Central Java, the heart of the island of Java, where the old Javanese traditions and the centre of arts still remain strong. The home for the most dangerous volcano in Java, Mount Merapi, the Mountain of Fire. 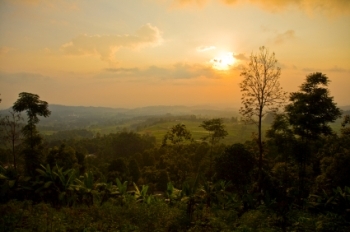 This is the part of Java where imagination takes place with volcanoes towering over the fertile plains. It’s here where you can find the magnetism of Borobudur temple, the biggest Buddha temple in the world and the excellent Prambanan temple. Also the place where you can find the ancient shrines of Dieng plateau, the place of the mysterious temple. The most forgotten place in this province. But don't under estimated this unpopular place, it's has truly magnificent view. Nevertheless there are countless beautiful places in this area of Java where you can visit. And not to forget, this is the corner of Java where you can experience the old time, especially in Solo and Yogyakarta, the most famous cities in this province with their art and cultural centers of Java, a place where gamelan and orchestras playing in royal courts. In these cities you can take some courses or lesson if you’re interested in batik and art of Javanese. It has Semarang as a capital. This is one of the six provinces in the island of Java. It has a population more than 31 million in 2005; it makes the third most populous province after West Java and East Java. It has an area of 35,548.20 km2. One quarter of the total area of the island. Geographically border by West and East Java and to the north and the south the sight of Java Sea and Indian Ocean. It has temperature between 18-28 degree Celsius with 94 % humidity. The province is also bigger because of the offshore island, Karimun Jawa Island in the north and Nusa Kambangan Island in the south west, also belong to this province. The people speak of course Javanese beside the main language Indonesian. Ambarawa, located on the south side of Semarang, about 50 km. The place is much known for their railway museum, which that you can visited in the heart of the city. The railway Museum, in the middle of the city of Ambarawa, here you can enjoy the collection of the old train made by the Dutch and the German. The Palagan Museum, in the heart of the city, built in 1974 to remember and to owner the hero’s during the revolution with the Dutch in 1945. The collection consists of the sculptures, old revolver, and the collection of the World War II. Bandungan Indah means Lovely Bandungan, in the village of Bandungan, 7 km from Ambarawa. Lovely place to visit with cool air temperature. Not far from Bandungan, you’ve come to the most beautiful temple locations of Java, the Gedung Songo temple, about 12 km form Ambarawa. This nine little temple surrounding by spectacular views, among ravines and hot sulphur springs. Jogjakarta,has own province, the special district of Yogyakarta, but geographically lie in Central Java. The most magnificent city of Java, and you’ll find the finest art and culture. There are also schools and colleges that you can follow if you’re interested. Anyway this is really a fine and old town with incredible attractions around the city like Borobudur and Prambanan. Click here to know more about this city. Kaliurang not far from Yogyakarta, about 25 km to the north, you’ll find Kaliurang, a fine hill resort. It stands on the slopes of Mount Merapi, about 900 meter. This is the lovely place to escape from the heat of Java. Mount Merapi, one of the most dangerous volcanos of Indonesia. The last and large eruption was in 2006, before the Yogyakarta earthquake. The volcano makes part of the Pacific Ring of fire, and area where the largest number of eruption and earthquake are dated. Some of people still climb this volcano regardless the danger. Climbing from Kaliurang is one of the most difficult routes. If you’re interested to climb this mountain, you need a guide to trek up high. You can ask locally people who live in the village around Mount Merapi, they usually know who you can contact with so you can climb safely. Jatijajar cave, located in Kabumen Regency, about 130km west of Yogyakarta. The cave is one of nature wonder. It’s one and huge limestone cave decorated with stalagmite and stalactite. Around the cave you’ll find the carves statues of people and animals related to the legend of Kamandaka. Not far from the cave, on the south coast 40 km from Kabumen, there is a beach resort called Karang Bolong. The place is much known for the local people for the nest of sea swallows. Every three months the place is very busy by people who make a living by collecting the nest and selling them in Chinese restaurant. But the people held the ceremony before they do that. The ceremony held in January, April, August and September. We’ve come now to Solo, one of the cultural centers in Central Java, the old royal city lie on the most important river of Java, Bengawan Solo River. Like Jogjakarta this city is the home for many lovely sultan kratons like Surakarta and Mangkunegara Kraton and the finest batik center of Java with different style of batik from Yogyakarta. There are wayang performance that you can enjoy, or visit Radya Pustaka museum with the collection of gamelan instruments and wayang puppets. And there are enough interesting place where you can visit around Solo, like Sukuh temple, the most mysterious temple of Java high on the slopes of Mount Lawu about 36 km east from Solo. At last but not least, Semarang the capital city of Central Java. The city is not really attractive for the tourist like Yogyakarta and Solo and regardless of that and the heat of the city. There are some interesting places that you can visit around the town. Like “Gedung Batu” or Stone building Sam Po Kong, the unique Chinese temple on the south west of the city. Or visit the beautiful lake of Rawa Pening on the slope of Mount Merbabu and Mount Unggaran, peaceful and beautiful lake. So, I think you won’t be boring to stay a few weeks in Central Java. There are enough to do and to see. Old province combined with great attractions, it makes the place of fantasy.